N-2015/12/17 - Let There Be Peace on Earth - Meyer Tool & Mfg. That’s the title to one of my mom’s favorite songs. Not specifically a holiday song, but such an appropriate sentiment for this time of year. Peace on earth. A sought after commodity in incredibly short supply, our world seems anything and everything contrary to peaceful these days. Images of a frustrated world abound. War, protests, natural disasters, poverty and senseless violence occur daily. And then there’s the personal strife; whether it’s illness, financial, career or emotional, everyone is fighting some sort of battle. We may not feel as though we have the power to change the world, but we certainly have the power to plant the seeds of peace in those whose lives we touch daily. Perhaps by consciously taking action to sow the gift of peace in the hearts of those around us, whether we know them or not, we will slowly but surely impact the world. At a minimum, taking such noble action will no doubt bring a sense of peace to our own heart, making the battles we face a bit easier to endure. So that’s what we, at Meyer Tool, wish for everyone this Christmas season: Peace. 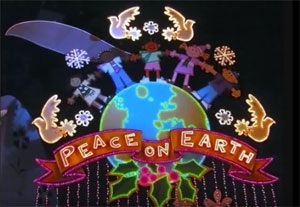 Peace on earth and peace in our hearts. And that each and every one of us will consciously help make that happen, one interaction, one kind word and one smile at a time. …and let it begin with me.